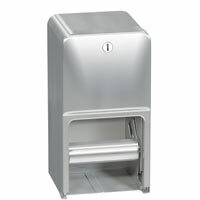 [XPB-5A10] Our Surface Mounted Toilet Paper Holder is fabricated in stainless steel with satin finish on exposed surfaces. Single roll up to 5-1/4" diameter in standard roll dispenser with drop-down roll-in-reserve; rolls mounted on non-removable molded polythylene spindles. Equipped with bottom-hinged service door with keyed tumbler lock. Universal keying. For shipping quotes, discount orders or questions please call our Customer Service Center at 1-877-483-9270.